Japanʼs presence in the global rule-making process was timid, to say the least, during the Cold War. Although it presented itself as a victim of Hiroshima and Nagasaki, Japan was also under the extended nuclear deterrence of the United States. However, recent initiatives such as the Arc of Freedom and Prosperity or Free and Open Indo-Pacific Vision brought Japan into the global governance stage. This lecture will discuss cases of global governance on nuclear non-proliferation and outer space. Japan faces a non-proliferation challenge from North Korea and a space threat from China. Taking initiatives in these domains is essential to Japanʼs security as well as to maintaining global order for peaceful use of nuclear and space technologies. As a tech-advanced country, Japan plays a certain role in providing ideas and technical support for both domains. These cases show how Japan sees itself as a player in the global governance structure. Kazuto Suzuki is Vice Dean and Professor of International Politics at the Graduate School of Public Policy, Hokkaido University, Japan. He worked as an assistant researcher in the Fondation pour la Recherche Stratégique in Paris, France, and as Associate Professor at the University of Tsukuba (2000 to 2008). 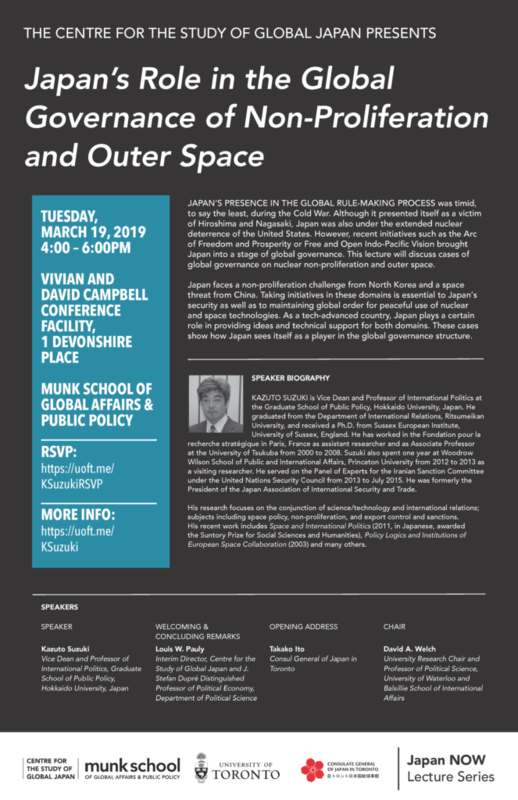 Suzuki was a visiting researcher at the Woodrow Wilson School of Public and International Affairs, Princeton University (2012 to 2013), and he served on the Panel of Experts for the Iranian Sanction Committee under the United Nations Security Council (2013 to July 2015). He is a former President of the Japan Association of International Security and Trade. Suzuki’s research focuses on the conjunction of science/technology and international relations, including space policy, non-proliferation, and export control and sanctions. His recent work includes Space and International Politics (2011, in Japanese, awarded the Suntory Prize for Social Sciences and Humanities), Policy Logics and Institutions of European Space Collaboration (2003) and many others.